Journalists and others interested in San Francisco’s Bay Area Travel Writers are invited to sign up for our occasional press releases, read press stories about our organization, access our online press kit, and contact us. New Full-Color Book Celebrates California’s National Parks on 100th Anniversary of NPS (NewsWire, 2-8-16). 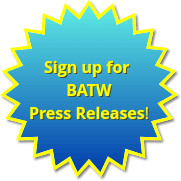 Want to receive occasional BATW press releases? Sign up here.